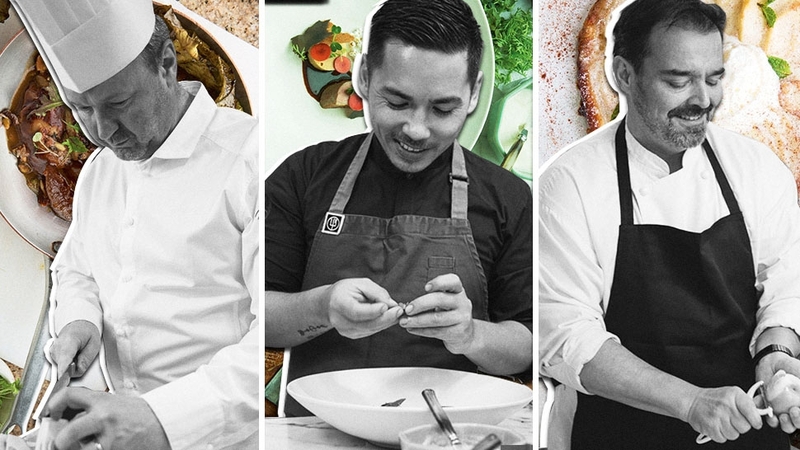 Veterans and emerging chefs put forth their versions of four dishes. As professions go, being a chef has never been a kind one. Examine a working chef’s hands, and they will be covered with scars from knife wounds, burns from the spatter of hot oil, roughened by constant exposure to acidity and the regularity of washing them clean when moving from one station to another. The heat of the stoves and oven makes the skin sag, making them look prematurely old. And the hours of a restaurant take their toll on marriages and relationships. Despite the intensity of one of the most demanding jobs in the world, the glamour of the white toque—though many chefs these days choose not to wear one—has never been greater. In the old days it was one of those professions that hovered on the edge of credibility, the way these days one thinks of electricians or landscape gardeners: more of a craft than an art, respected but not revered, something that surely required some amount of talent and skill; but not what you would whisper into your baby’s ear hoping they’d grow up to be one day. In the last three decades, chefs from the current generation of restaurateurs effected an immense change in the way that diners think about restaurants, the way people think about food, and the way the industry thinks about its practitioners. Those who were there in the beginning, who were not just part of but created Manila’s restaurant scene, remember a time before you could buy rosemary from specialized suppliers, let alone supermarket shelves; while the most recent crop of creative minds are not just familiar with immersion circulators and nitrous oxide siphons, but are foraging in the rainforest outside Manila for new flavors and ingredients. The best chefs want to express themselves, have egos the size of a rotisserie oven, are tyrants in the kitchen (and often outside of it)—but all share a fundamental desire to make people happy. 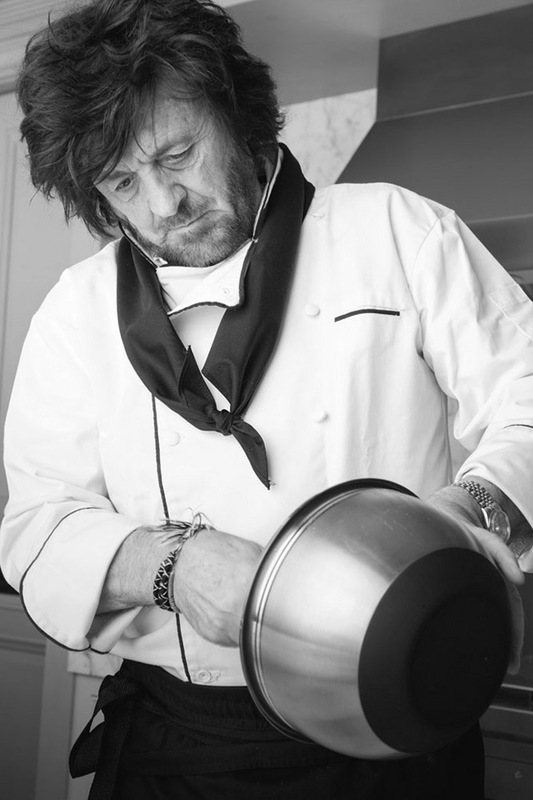 This was the idea behind the portraits of eight chefs that we did in this article. All of them are currently working and running successful restaurants—to a large extent the logistical nightmare of trying to coordinate the shoots was because of the rigid constraints of their work. 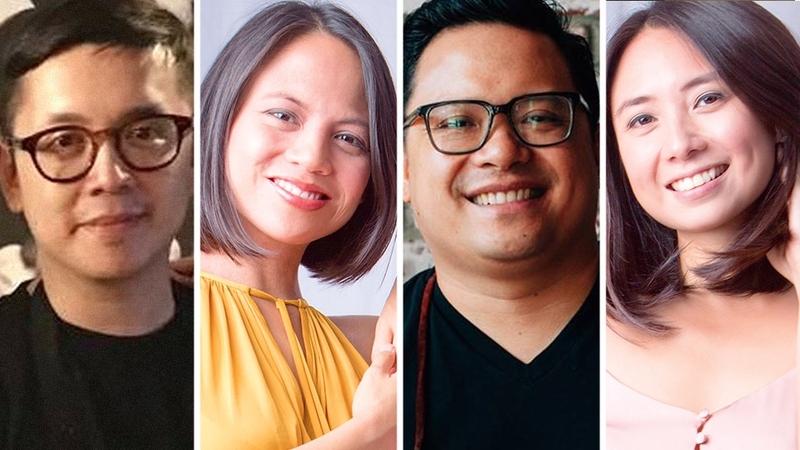 We chose—or perhaps identified is a better word—the four chefs who were instrumental in bringing fine dining to Manila. And then we chose four chefs who are not yet household names, but whom we felt are taking the right steps and creating all the right sorts of things and working with the kind of ethos that should make them important creative forces in the industry very shortly—with the speed at which the industry is moving, this could be anything from a few months to a year or two. We didn’t want the veteran chefs to prove their mettle or continued relevance: this is borne witness to every day, by the way, their names still roll of people’s tongues when talking about the dining scene in this country, and the steady stream of satisfied clients who emerge from the restaurants every night. 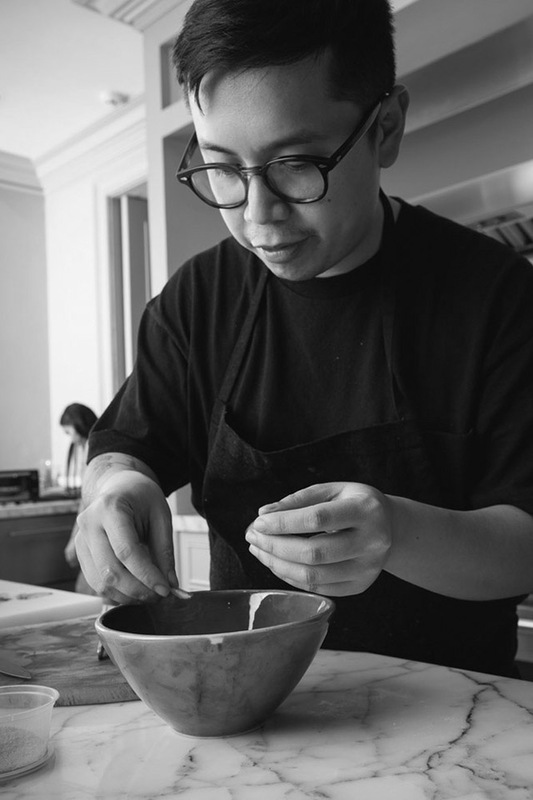 We wanted them to cook the dishes they cooked when they were trailblazers, trying to get this idea of Filipino fine dining of the ground. 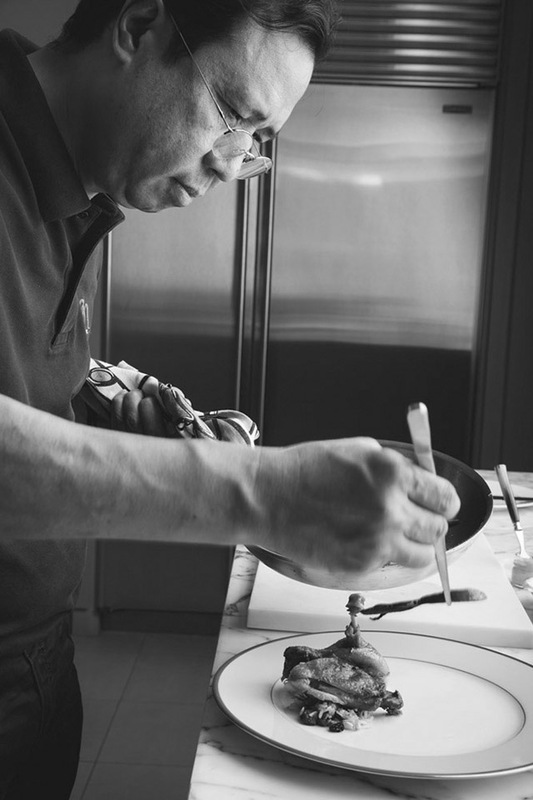 And we wanted the young chefs to be iconoclastic, to pay their homage to and be respectful of the work that their older colleagues had done, but not be afraid to take it apart, to deconstruct, to make it theirs. As in art, as in literature, as in philosophy, slaying the father is an essential part of the rite of passage. It would have been wonderful to come up with a grand unified theory of coming of age, of mentorship, of handing down the torch; but in each of the cases, the dynamic was different. Perhaps what surprised us continually was how small the age gap was between the chefs in most cases; the dynamic was more avuncular or paternal, rather than that of teacher and student. We were expecting more differences, but saw more similarities: being obsessive about details, the ability to move quickly under pressure, the same anxious glances as to how their creations were being received by the creative team behind the shoot. Chefs have been called many things: magicians, poets, alchemists. But it’s not a profession that you get into if you don’t care about what’s going on at the other side of the pass, or if you don’t glance at the plates coming back in once in a while to see how much is left uneaten. How much of it, too, is a matter of the markedly different role of the chef in 2017 compared to what it was in 1997, when the first generation of chefs were beginning to break the rules of traditional cuisine, to incorporate local elements into their dishes, and play around with a diner’s expectations of what a restaurant meal should be? And how much of it is the natural trajectory of any artist or craftsman's life: whiplash creativity gets honed into discipline; public adulation for iconoclasm and crazy ideas gets distilled into admiration for consistency and work ethic; balancing personal ambitions with the realities of bills, family, and mortgages; and finally learning to be a good teacher and mentor. Chefs have been called many things: magicians, poets, alchemists. But it’s not a profession that you get into if you don’t care about what’s going on at the other side of the pass, or if you don’t glance at the plates coming back in once in a while to see how much is left uneaten. The best chefs want to express themselves, have egos the size of a rotisserie oven, are tyrants in the kitchen (and often outside of it)—but all share a fundamental desire to make people happy. 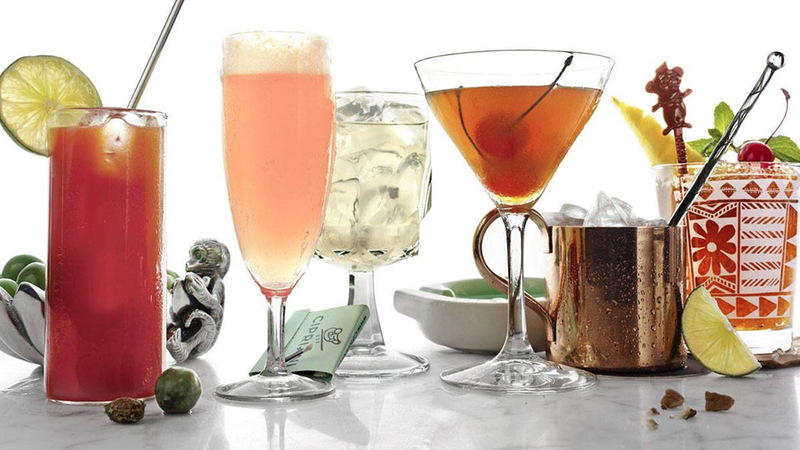 And that’s what we, the customers, have learned in the three decades since fine dining burst out from the stuffiness of hotel formal banquet halls and into fine-dining restaurants and then casual dining and gastropubs and resto-bars and gastro-bistros. We’ve learned how to respect food and those who make food, and give them the creative space to make us happy. That's why we have over 50 creative dining restaurants in Manila alone instead of five; that’s why we have suppliers growing micro-greens and raising organic lamb; it’s why we have a local food movement and customers willing to shell out generous amounts for a meal so that chefs can continue to push the boundaries of what’s possible. Given the amount of foie gras we ate on this shoot, we may not be around to see what these young chefs are up to in 30 years’ time, and what a new generation of chefs will be cooking by then. While they work together behind the counter, Justin addresses Ariel as “chef,” as he would in a kitchen. 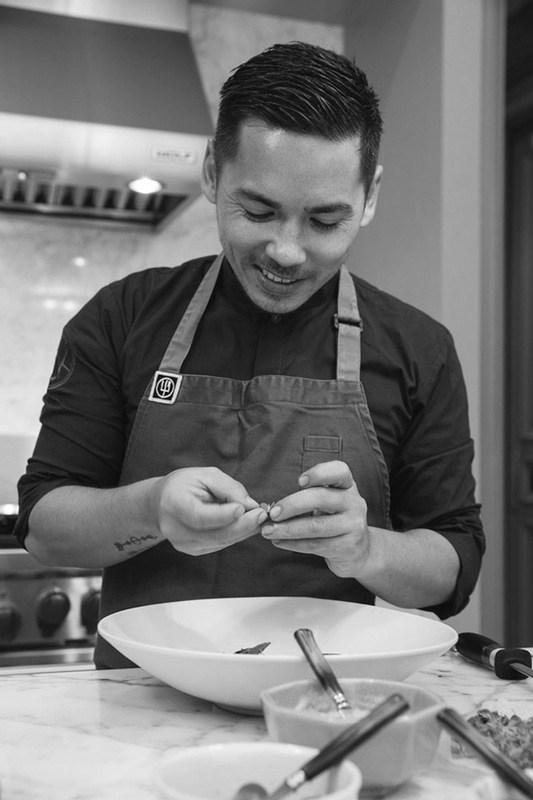 He was 12 when he had one of his first encounters with fine dining at Ariel Manuel’s restaurant in Malate—and one of the dishes he had was the confit de canard. Manuel trained at CIA Greystone in Napa; Golangco is also a CIA graduate. But while Manuel has stayed focused on the high end, for decades at Lolo Dad’s and now at his new restaurant, Bistro Manuel in Poblacion, Golangco opened a quaint little place called Bucky’s, incidentally just a few streets away from where Bistro Manuel is situated. And Ariel Manuel has a son named Justin. 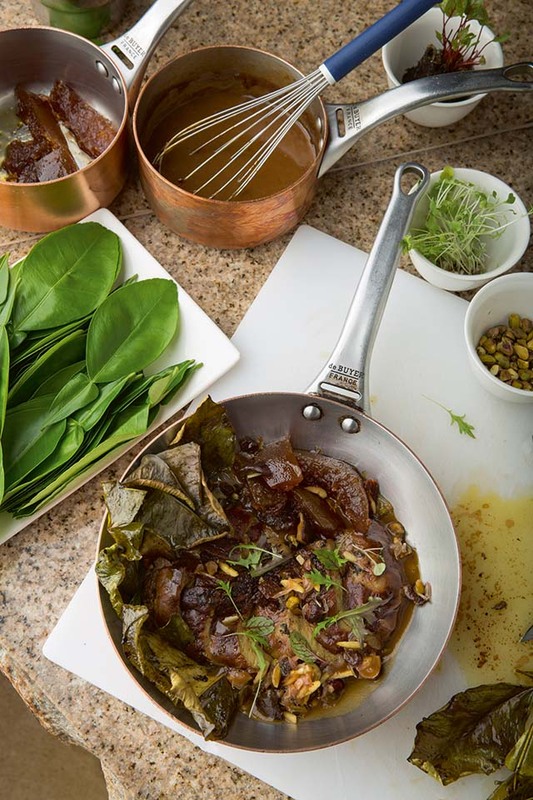 Ariel Manuel’s confit de canard is made in the traditional manner, but even early on he wanted to give it a twist, and he served it with rice—it’s a dish that begs to be eaten with rice, as far as Filipinos are concerned— and makes what he jokes is a version of yang chow fried rice, but with western ingredients, like a dry risotto. 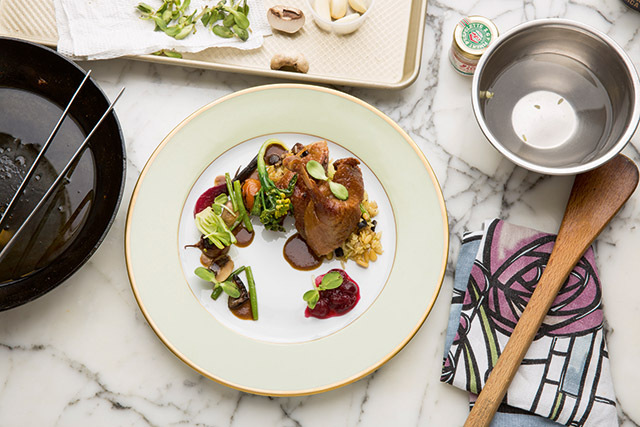 Golangco’s take on the classic dish he first tried as a boy doesn’t stray too far from the original: he’s made the confit into a roulade and it’s piquant from the preserved lemon and served on a bed of simmered-down onions and cauliflower. It feels like something that should be on a restaurant menu somewhere—but it sits strangely on Bucky’s menu, which is known for, among other things, their fried chicken. 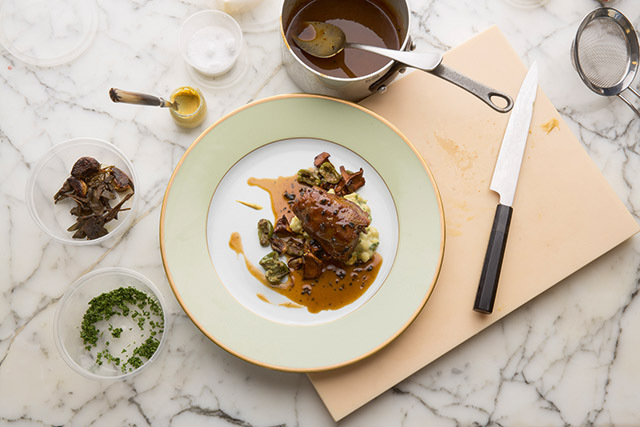 We all know where to go for a classic confit de canard, as well as other classic Lolo Dad’s dishes like his roast rack of lamb with blue cheese risotto. But for Golangco’s take on more rarified cuisine, we may have to wait. A funny thing it is, scheduling. Not so funny when you’re doing it, and a typhoon comes your way, but funny afterward when you’ve got the answer coming before the question in the conversation. So it happened that Josh Boutwood ended up doing his response to Cyrille Soenen’s iconic dish of duck liver with pomelo before we did that shoot. In this pairing more than any other, we saw the difference in sensibilities between generations. 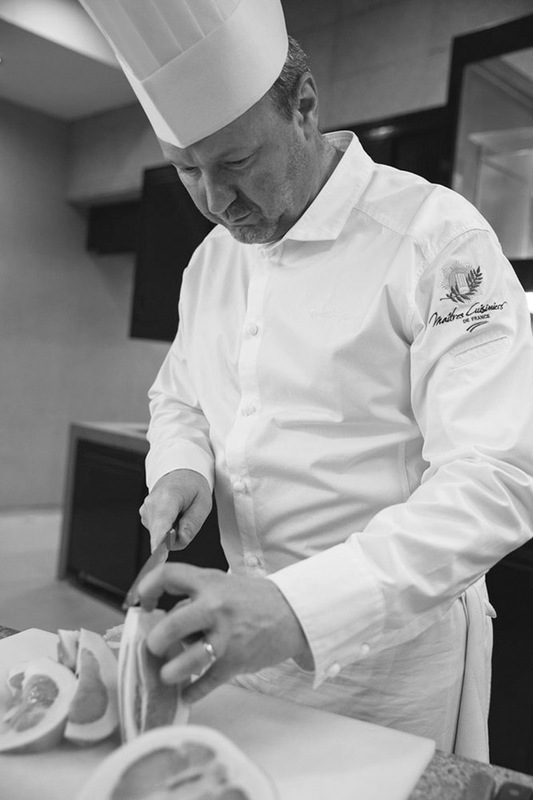 Boutwood is the ultimate corporate chef, helming 69 restaurants as well as his own brainchild, Te Test Kitchen, in the evenings. Soenen oversees 14 outlets in Resorts World Manila, plus in-room and casino-floor dining, as well as running his restaurant there, Impressions at Maxims Hotel. Just as Boutwood managed to carve out time in his career to give himself more work (and ultimately, sanity) by cooking degustation menus for 20 guests a night at The Test Kitchen, Soenen was all too willing to reprise a dish he had not made for years, and help us obtain a not-inconsiderable chunk of whole foie gras (from the venerable Rougie, no less, which is available, if you want to try the recipe, at Säntis). 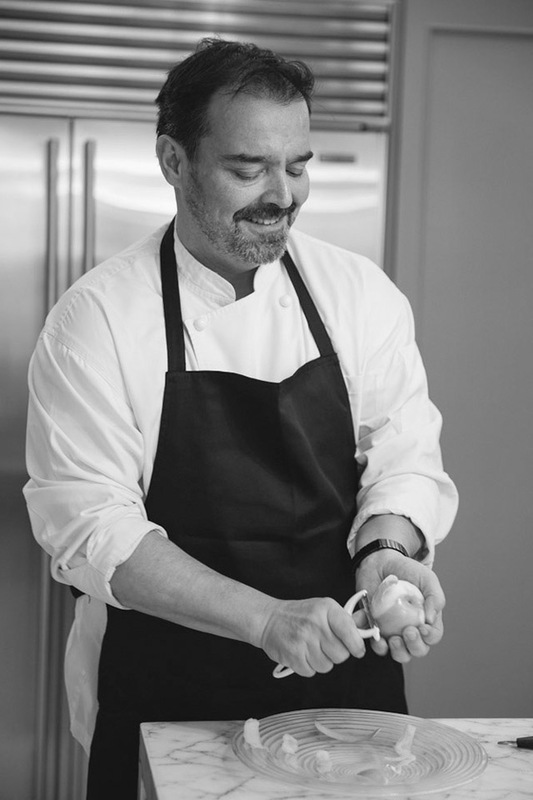 When he was working at Prince Albert at the InterContinental Hotel, Soenen wanted to create a dish that used local ingredients. Afer some attempts at using calamansi, he settled on pomelo, which had been earlier deemed too bitter—he blanches it 12 times, throwing out the water each time, and then makes a candy using a syrup at 30 degree Baumé. Te candied peel goes into a mix of other ingredients, which is roasted with the foie gras wrapped in a layer of pomelo leaves. The result is breathtakingly complex and rich. 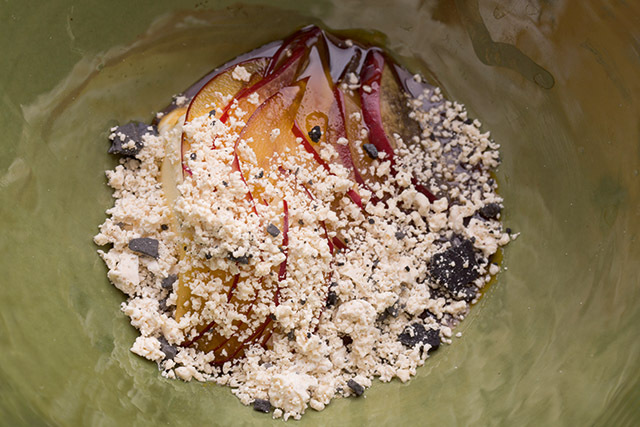 Boutwood’s dish is meant to slot into a menu among many other dishes, as is the custom with more contemporary menus: a longer succession of smaller plates, rather than just a few very heavy ones. 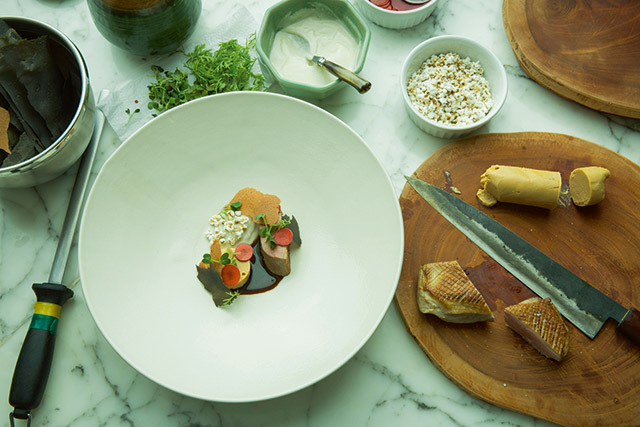 Tere is a restrained piece of perfectly cooked duck meat, and a slice of foie gras ballotine—but where it gets interesting is the sauce. Who would have ever thought yeast could taste so good? The rich, dark, malty flavors cut through the fat of the foie gras, melding it with the slice of duck meat. I could imagine the dish as the main course of one of Boutwood’s expansive degustation menus, just as I could imagine Soenen’s foie gras as the pièce de résistance of one of those expansive, note-perfect French dinners that dominated the end of the last century. Of the different point and counterpoint we encountered, this pair had the most continuity between them. 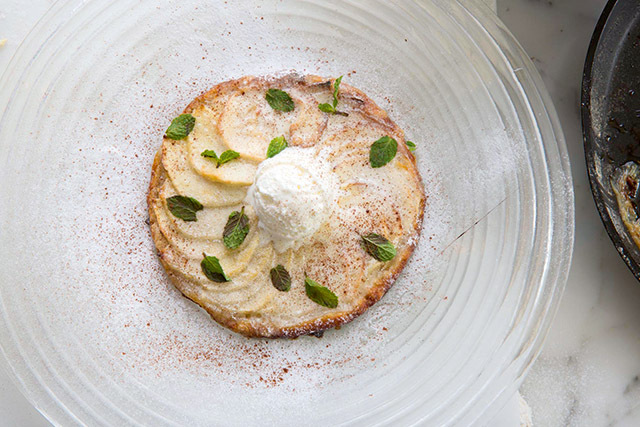 Markus Gfeller’s made his well-known apple galette, a favorite of diners at all the restaurants where he has worked starting with Grassi’s, then Soleil, later Aqua, and eventually CAV wine bar, where he is now head chef and partner. The apple galette is almost Zen-like in its simplicity, which allows for fewer errors. A ring of apple slices on a puff pastry base, baked, smothered with cream, then broiled to get the cream rich and brown, and then a dollop of cinnamon ice cream. 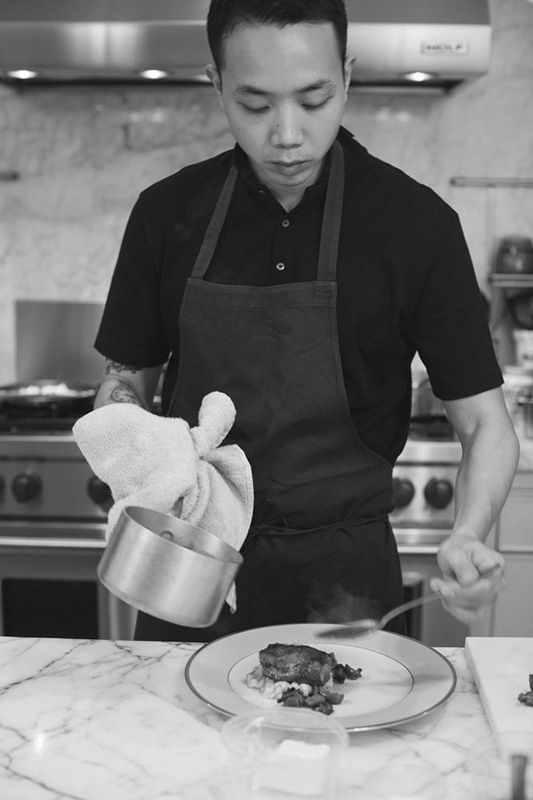 Santos’s background and forte is Asian cooking, mostly Singaporean but Cantonese as well; he knows his wok and cleaver skills, and enamored of Asian ingredients as well as techniques. He cooks at two restaurants, Hey Handsome and Your Local. 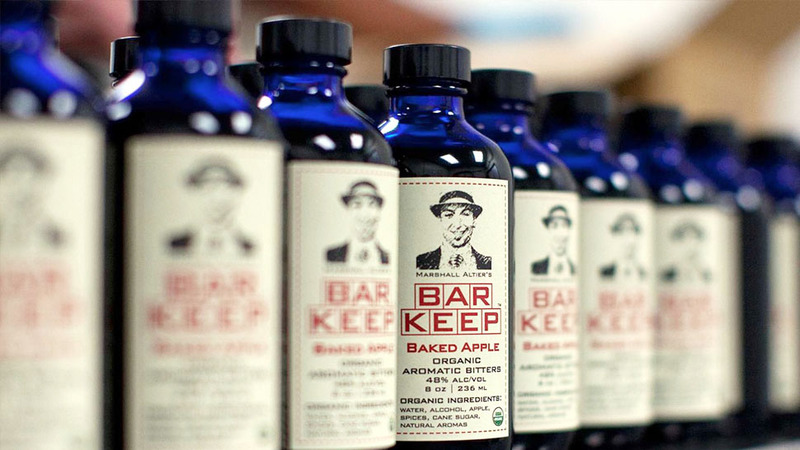 We asked him to create the recipe as though it were something he would serve at one of his restaurants, and he did not disappoint: the apples were pressed, in a vacuum-sealed bag, with galangal juice; the process concentrated the flavor so that the apples tasted more appley than they could achieve on their own, and added just the slightest note of fermentation. The pili nut butter added the bass notes. The result was a photogenic jumble in the contemporary style, while the flavors—whether intended or not—were a coherent symphony of different voices and textures and flavor notes. 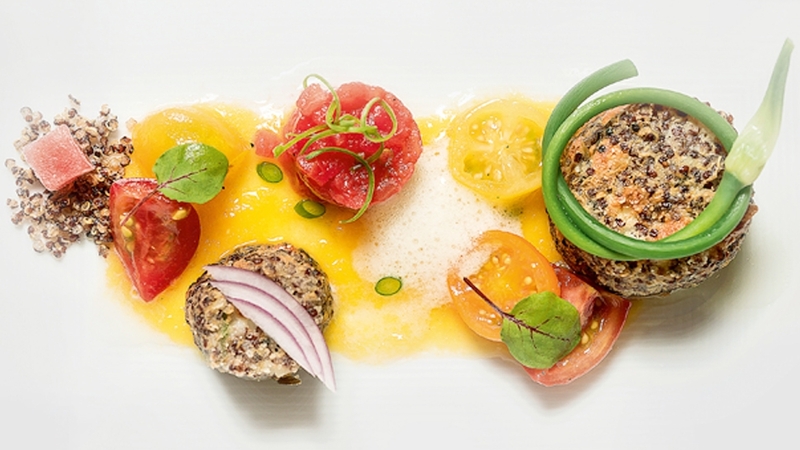 There was no better dish: Gfeller had executed a traditional dish with his trademark perfection; Santos had improvised an interpretation that was spontaneous and playful. It’s the difference between classical and jazz. We happen to like both. 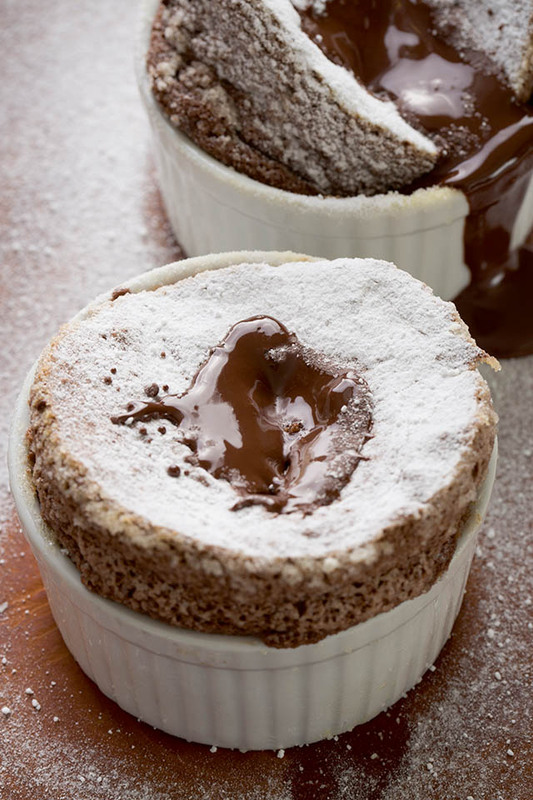 “The souffle is very, very demanding,” he said, pulling out his ingredients. “It’s not about opening the oven door or having more egg whites. It’s about the base, keeping everything clean, timing it.” He made one batch of souffles using a base that had been prepared by his staff. The souffles seemed perfectly presentable to us, but he was visibly annoyed. “Someone’s going get a talking to,” he muttered. “We’re going to make a new base.” He called for a dozen more eggs, each of which he examined carefully before using to see if the thick albumen was still intact. He made a base—interestingly, not the traditional bechamel base but a pâte à choux base using milk, which he then continued to cook for about 15 minutes afterward. This time he was happy with the results, and we began to learn that we had eaten so many bad souffles that we had forgotten what the real thing tasted like. It wasn’t just about height; it was the balance between lightness and substance, and just the right seasoning as so not to overwhelm the palate. It was the perfect souffle, as befitted the chef behind Le Soufé. 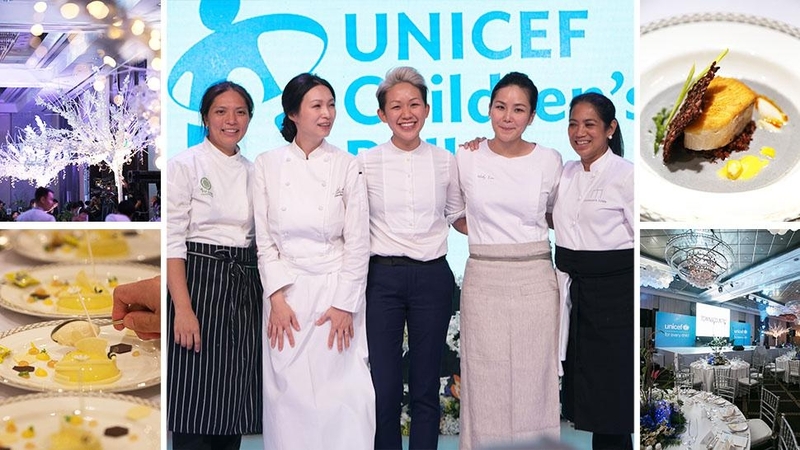 We were wondering what Monica Yang, the research and development chef of The Moment Group, would come up with as a contemporary interpretation of the souffle. Afer all, anything souffle-like would still be a souffle. But she took the idea down to its basics: the taste of cheese, and the feeling of lightness. Lightness was achieved by means of a siphon. I’ve seen many restaurants use this, and even Starbucks uses it for its whipped cream; in Noël Coward films they use a siphon to spritz out soda water for their gin and tonics. Te gorgonzola mousse and cream cheese sorbet were like echoes of one another, one just slightly more pungent and lighter than the other. 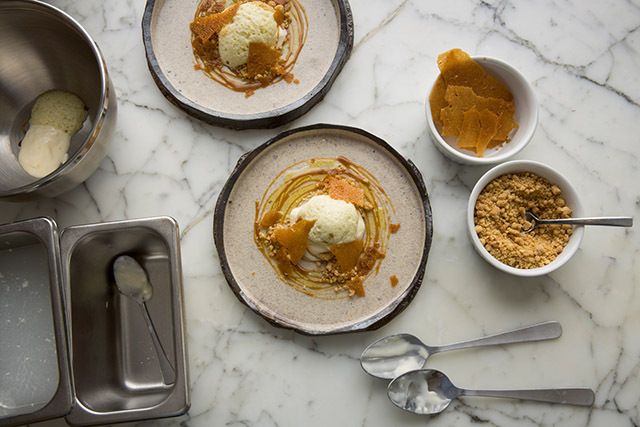 As with other contemporary chefs, there were more flavors going on; but this is only natural—modern chefs have so much more ingredients at their disposal, and it’s only instinctual to try and combine them. Because the shoot took longer than we thought it would, we ended up eating the cheese souffle for lunch and then having spoonfuls of Yang’s creation for dessert, and realized they were the perfect complement to one another. It would be a very cheesy meal—but whoever complained of too much cheese? Start with a souffle, have the main course, and end with a light cheesy dessert that hearkened back to the start of the meal. Traditional cuisine, minimalist with its ingredient list, using tools that haven’t changed in centuries; and modernist cuisine with multiple flavor profiles and equipment appropriated from laboratories and industrial preparation, are not in competition with one another. We need them both, and even if it rarely happens, they are wonderful together. This story was originally published in the November 2017 issue of Town&Country. 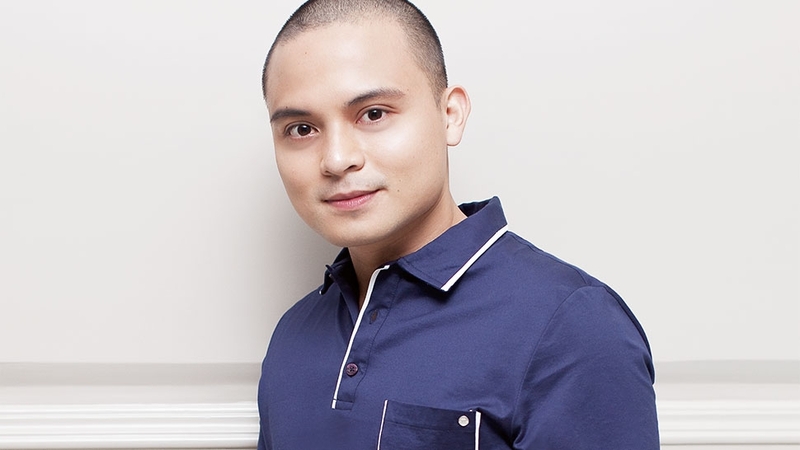 Clinton Palanca has won awards for his fiction and in 1998, came out with Landscapes, a book compiling his short stories and earlier works for children. Today, he ventures into food writing with his regular column on In-quirer Lifestyle, and with restaurant reviews for other publications.